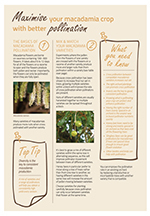 The Australian Macadamia Society represents the biosecurity interests of macadamia producers and the industry. In 2015–16, macadamia production was valued at $198 million (LVP) and in 2017 the value of production was $272 million. Annual production from approximately 700 growers on 22,000 hectares is approximately 50,000 tonnes in-shell or 15,000 tonnes of kernel. 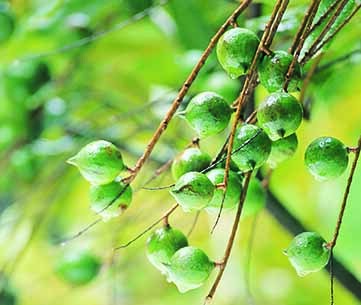 The majority of plantings are varieties of Macadamia integrifolia. Of these about 80 per cent are Hawaiian varieties with the remainder being Australian. New Australian-bred varieties are likely to be released in the next few years. Harvest commences in March and runs through to August. Australian macadamia production stretches from Coffs Harbour on the NSW north coast to Mackay on the north Queensland coast. The majority of macadamia plantings are in northern NSW, Bundaberg and south east Queensland. The northern rivers region of NSW and Bundaberg each comprise about 40 per cent of production. Bundaberg has the fastest growth in production and is now the largest growing region in Australia. Approximately 70 per cent of the crop is exported, principally to Europe, the United States, Japan and other Asian countries as kernels and to China as nut-in-shell. Australia is currently the world’s largest producer of macadamia kernels. South Africa and Kenya are the other major producers. In order to encourage biosecurity awareness within the industry, approximately 70 per cent of orchards employ professional pest scouts and the Australian Macadamia Society convenes an annual pest scout forum where pest pressures for the previous season are reviewed and any new pest and disease sightings reported. Macadamia trees (Macadamia intergrifolia and M. tetraphylla) are tall evergreen trees growing to 20 m in height. 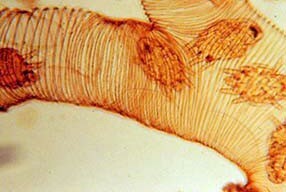 The flowers are 5–10 mm long and are born on racemes with 100–150 flowers. There are about 2,500 flowers on a tree. Each flower has 20 ovules, four anthers attached to the petals, and a long stigma. It takes about a week for all the flowers on a raceme to open, with most opening over 2 days. Most cultivars are partly or completely self-incompatible so inter-planting with compatible cultivars is usually necessary. Cross pollination has been reported to increase nut weight as well as the number of nuts. Nut set in Australia and New Zealand is usually less than 1 per cent. 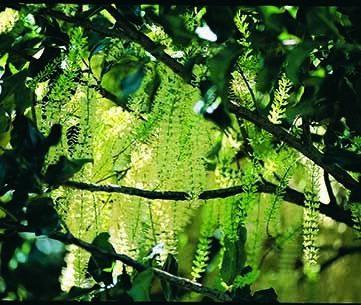 A three-year study of macadamia pollination in Queensland, Australia found pollination to be a limiting factor. In Australia, macadamia will start flowering in August and September. The flowers produce both pollen and nectar. The anthers dehisce several days before the flower opens and the sigma only becomes viable after the flower opens. Flowers are visited by a range of insects including honey bees. 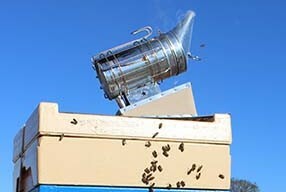 Most honey bees collect nectar in the morning and some honey bees collect pollen in the afternoon. The flowers are attractive to bees for 3 days after opening. Each flower produces relatively small amounts of nectar. 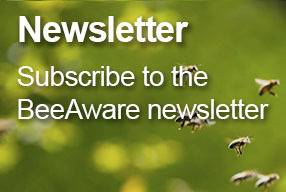 The pollen gatherers are reported to be better pollinators than nectar foragers as they are more likely to contact the stigma. Since the macadamia is native to Australia, the flowers are also visited by native stingless bee and solitary bees such as Trigona sp. However, as stingless bees are only managed on a small scale, honey bees and unmanaged stingless bees are probably the most important pollinators of macadamia. 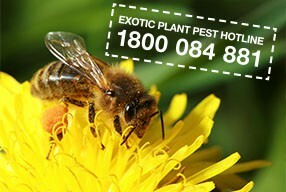 It has been estimated that about 150 bee visits to a racemes are needed for full pollination in Australia. 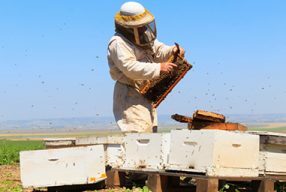 The optimal number of bee hives per ha is 5 to 8 based on research from both in Australia and overseas. As pollen collectors are more effective pollinators than nectar foragers, colonies should be managed to promote pollen collection eg high brood to bee ratios, sugar syrup feeding and pollen trapping or stripping.